The U.S. Navy has finally selected which of five candidate designs it will use for its new “Block V” Virginia-class submarines, meant to replace the sailing branch’s existing underwater arsenal vessels starting in around a decade’s time. According to the U.S. Naval Institute, the Navy has chosen the least expensive design, helping to ensure the new boats don’t break an already-strained shipbuilding budget. That’s the good news. The bad news is that the cheap design is also the least elegant, and could make the Block V subs noisier and easier to detect than their predecessor ships. Today the Navy’s roughly 50 attack subs combined can carry 1,200 Tomahawk cruise missiles for attacking targets on land. 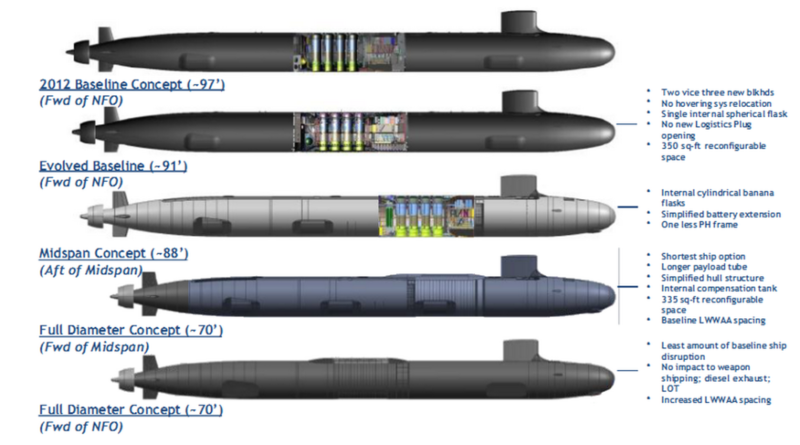 More than half of the Tomahawks are loaded on just four boats: the so-called “SSGN” conversions of former Ohio-class nuclear ballistic missile submarines. When the 1980s-vintage SSGNs wear out in the mid-2020s, the Navy will lose half its undersea missile arsenal. Thus in 2009, the sailing branch began studying ways to add more Tomahawks to new Virginia-class submarines planned for construction. Current Virginias carry 12 Tomahawks in launchers fitted vertically to the bow. 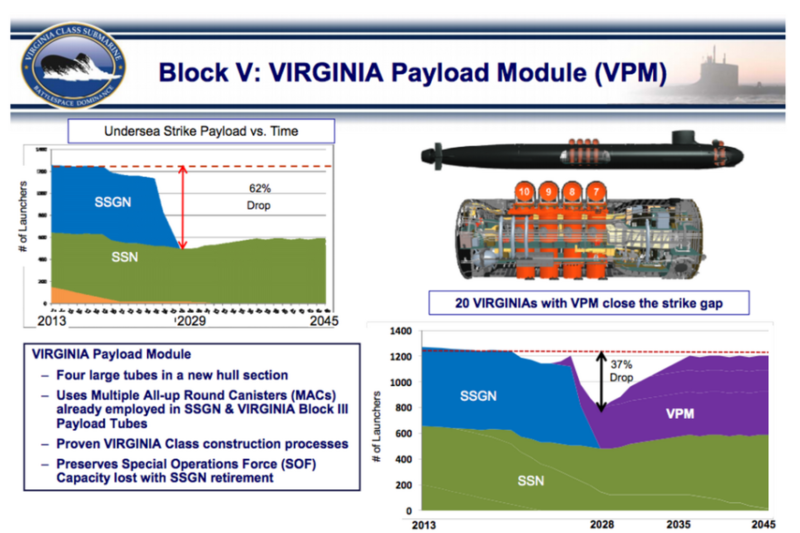 Naval architects with General Dynamics’ Electric Boat in Connecticut, America’s main sub-builder, came up with five different ways to add four extra seven-round launchers to the mid-sections of future Virginias, for an additional 28 missiles per boat. Building 20 of these improved boats at a rate of two per year starting in 2019—Block Vs at first, possibly followed by Blocks VI and VII with additional features—would nearly make up for the loss of the SSGNs, restoring the 1,200-missile total by the time the 20th ship enters service in the mid-2030s. Each of Electric Boats’ five options for the Block V subs proposed inserting a plug into the Virginia design’s standard 380-foot hull. There were proposals for 97-, 91-, 88- and 70-foot plugs. As sketched by the architects, the longer layouts required the shipbuilder to shrink some internal spaces in order to squeeze in the mechanism for the missile tubes’ doors without adding to the Virginia’s 34-foot diameter. But that would be delicate and expensive work. So to keep the cost of a Block V Virginia as close as possible to the $2.5-billion price of a standard undersea boat, the Navy opted for the less expensive option of adding an external protrusion to the sub design’s hull and fitting the door mechanism inside that. The trouble with this so-called “turtleback” structure is that it creates “hydrodynamic and potential acoustic problems, especially at the higher speeds,” according to retired Capt. Karl Hasslinger and John Pavlos, writing in the Navy’s official Undersea Warfare magazine. In other words, the cheap missile plug could make the Block Vs louder … and easier for an enemy to detect by sonar. That’s because the ideal shape for any submarine is a smooth elongated teardrop, according to P.N. Joubert, who studied submarine design for the Australian Defense Department. Adding lumps and corners to the teardrop form creates friction and noise. The massive square turtlebacks on Soviet Delta-class ballistic-missile submarines during the Cold War were a major reason those boats were fairly easy for U.S. forces to find and track. Granted, the Block V’s turtleback is slight. And as Joubert points out, elements of a submarines “must fit together like a jigsaw puzzle to make a complete and efficient design.” It’s no use having the quietest-possible new guided-missile submarines if you can’t afford to build them.